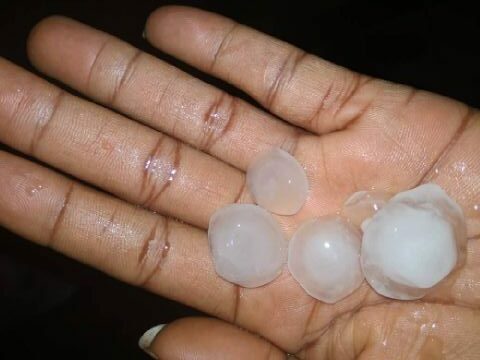 Hailstone fell on Friday evening in the Gudu District of the Federal Capital Tertiary. that some residents in the area were seen gathering the hailstones to have a closer view of what they looked like. said it was a blessing to witness the occurrence. One of the residents, Miss Chidinma Okoro , said this was the first time she was seeing hailstones and was very excited. “I have only heard and read about it but this is my first time of experiencing it. “We just started hearing something hitting the roof very hard and we all ran to the balcony just to see things like ice blocks falling down. Another resident, Mrs Theresa John, said she was awakened by the sound of the hailstones on the roof and was excited to see them fall from the sky. “I have seen hailstones before but this is my first experience in Abuja. It was quite exciting. Hail comprises of balls of irregular lumps of ice called hailstones. It usually falls in cold weather.